The analysts at comScore have today published their latest research detailing how Europe is progressing in areas like smartphone penetration, broadband and consumer digital services like video consumption — part of comScore’s ongoing Digital Future In Focus series of annual reports covering different geographical markets. In all, the online audience across the region, covering 18 continues, to creep up and at the end of 2012 was 408.3 million users, with Russia the biggest market at 61.3 million; and mobile users in the “EU5” — the top-five markets of Germany, France, Italy, Spain and the UK — are now up to 241 million, with 57% of them using smartphones. — Europe’s 408 million users is impressive, but it’s not the largest region worldwide, and it doesn’t have the most engaged users. 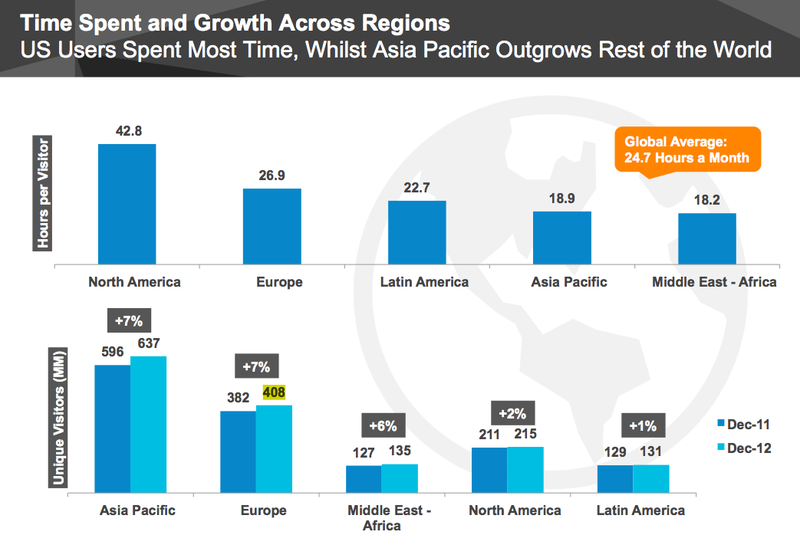 Asia Pacific continues to retain its crown as the single-biggest region for online consumers with 637 million users — a natural consequence, perhaps, of the fact that it also has the biggest population. As with Europe, it’s slightly misleading to think in terms of regions in the sense that we are talking about different language groups and different cultures of usage, but it still gives an idea of what the centers of gravity are in the tech world. Overall, growth of online consumers is not huge at the moment, with Europe and Asia Pacific’s rate of 7% for the year topping the chart. When it comes to usage, although North America is not the biggest in terms of online population — its online consumers are now at 215 million, or 16% of the world’s online population, compared to 66% in 1996 — its audience remains the most digital-friendly, with the average consumer spending 42.8 hours per month online. The fact that it’s a more mature and more receptive market are the main reasons why consumers in countries like the U.S. continue to be disproportionately influential. — In mobile, comScore focused only on the top 5 markets in the region, and in there the tipping point towards smartphones has well and truly been reached. Each of the five markets of UK, France, Germany, Italy and Spain now have more than 50% of consumers using smartphones, with Spain in the lead at 66% — for a combined regional penetration of 57%. These numbers, again, cover 2012, and I expect the figure to go up by a little jump again next year — and even more if comScore begins to widen the net to include other markets that are at earlier stages of development. 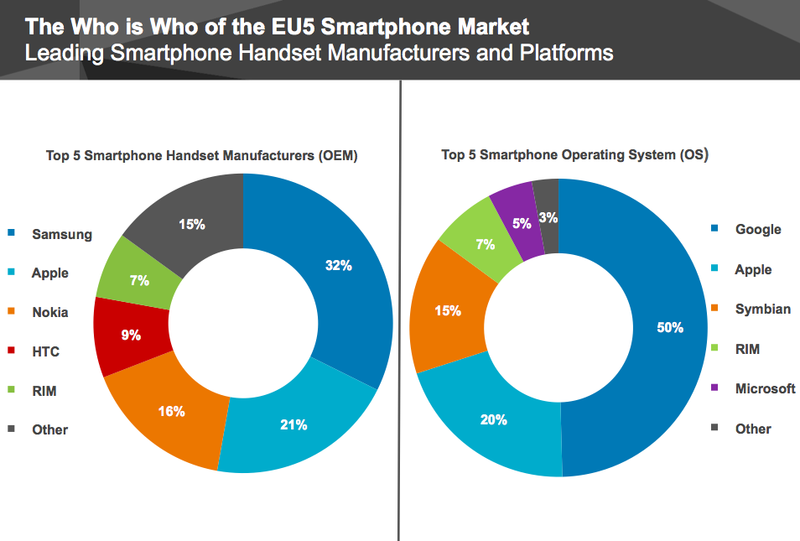 It notes at in December 2012, 75% of the devices purchased by consumers in the EU5 were smartphones, versus 66% a year ago. Samsung and Google’s Android, as before, continue to win the spoils in smartphones, with Samsung accounting for nearly one-third of all smartphones, and Android as the OS on half of all devices in use. Worth noting that Nokia base of existing Symbian users is still bigger than the base of users on Microsoft’s Windows Phone OS, with Symbian covering 12% of the market and all of Microsoft’s operating systems (which also include legacy Windows Mobile users) at 5%. 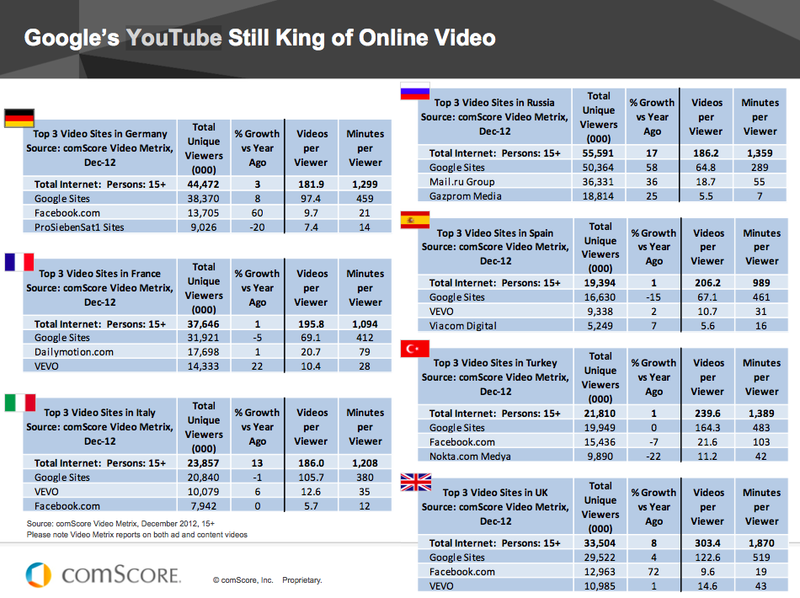 — In online video, YouTube continues to be the leader by a very wide margin in Europe, with minutes per viewer in seven markets — Germany, France, Italy, Spain, Russia, Turkey, UK — in the multiple hundreds, compared to double-digits for other providers (Turkey being an exception, where Facebook.com is making slightly more headway). While this week we saw reports, unconfirmed, that Yahoo wants to take a stake in YouTube competitor Dailymotion, judging by comScore’s numbers, it would be buying into a diamond in the rough: the only market where Dailymotion makes a showing is in its home country of France.